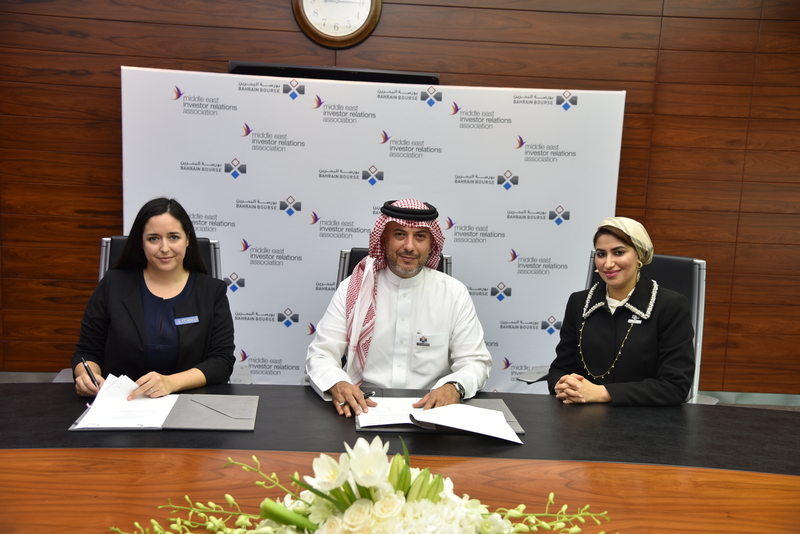 Bahrain Bourse signed on Wednesday 7th November 2018 an agreement with the Middle East Investor Relations Association (MEIRA) to promote the development of the Investor Relations (IR) function and corporate governance best practice in the Kingdom of Bahrain. The agreement was signed by Shaikh Khalifa Bin Ebrahim Al Khalifa, Chief Executive Officer of Bahrain Bourse and Clemence Piot, MEIRA General Manager, in the presence of senior executive management members. Following the signing ceremony, the Bourse, in collaboration with MEIRA, organized an Investor Relations Awareness seminar at the Bourse’s premises. The event welcomed a total of 30 professionals in the IR industry and addressed key topics which covered the importance of IR for listed companies and an introduction to the role of the Investor Relations Officer. The session also included a presentation of a successful case study on IR conducted by Eline Hilal, Investor Relations Manager at Aluminum Bahrain, who shared her experience as a local IR professional.